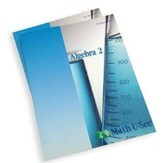 This Algebra 2 Universal Set includes everything you need for the Algebra 2 level, including the Instruction Manual, Instruction DVD, Student Workbook, Tests Booklet and 12 months of access to the Algebra 2 Digital Pack. The Algebra 2 level covers factoring polynomials, quadratic formula, graphing conic sections, rational expressions, imaginary & complex numbers, and more. The Instruction Manual features 31 lessons with detailed instructions and explanations of concepts. The back of the book contains line-listed answers to the student workbook and tests. The Algebra 2 Digital Pack includes an Instruction Manual PDF, lesson and test solutions, streaming instruction videos, and other online resources. Instruction Manual, 504 pages, hardcover. Student Workbook, 394 perforated, softcover. Non-reproducible; consumable workbook. Test Booklet, 104 perforated, softcover. Non-reproducible; consumable resource. 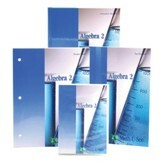 12 months of access to Algebra 2 Digital Pack. The Math-U-See Algebra 2 Student Workbook contains a number of worksheets for each lesson along with systematic review pages. "Honors Lesson" pages are designed to round out students' understanding of the main concepts. They are not designed to meet the requirements of a high school honors-level course and the designation "Honors" cannot be added to the course description even if all Honors pages are completed. The Tests Booklet provides opportunities for assessment with a test for each chapter, unit tests that cover multiple chapters, and a final test.